The new nine-month Prayer Course enables one to practise contemplative living according to one’s own lifestyle. 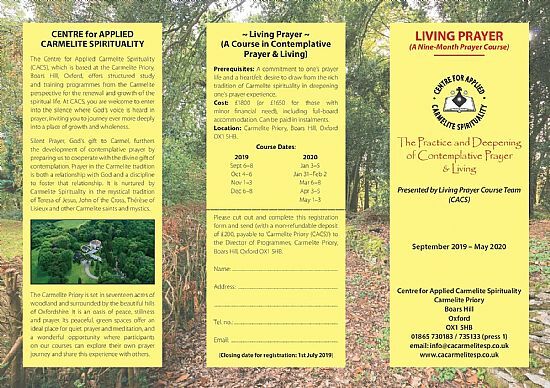 The course meets one weekend (Friday – Sunday) a month from September 2019 to May 2020 and is presented by the Living Prayer Course Team of the Centre for Applied Carmelite Spirituality (CACS) and invited speakers. · Deepening one’s experience of Silent Prayer, Lectio Divina, Contemplative Liturgy, Psalmody, Prayer Journaling, the ‘Gratitude Prayer’ and Spiritual Reading. · Nurturing the contemplative dimension of one’s lifestyle by exercising discernment, simplicity, forgiveness, integrity and commitment. The ongoing process of the Course provides an environment in which to integrate contemplative practices into one’s life. This integration is accomplished in part by opening oneself to God as a community and consenting to God’s presence and action individually and communally. Each weekend includes a review of the previous months’ practice(s), soul-friending, Silent Prayer, talks, sharing and rest. 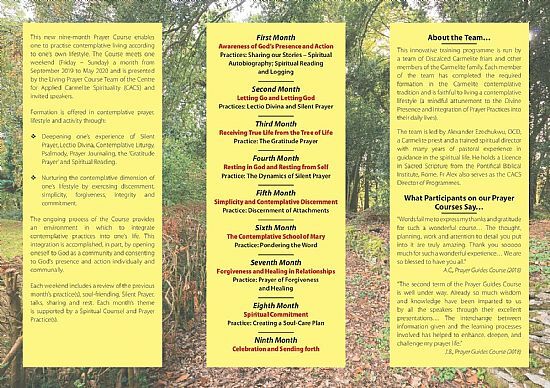 Each month’s theme is supported by a Spiritual Counsel and Prayer Practice(s). A commitment to one’s prayer life and a heartfelt desire to draw from the rich tradition of Carmelite spirituality in deepening one’s prayer experience. £1800 (or £1650 for those with minor financial need), including full-board accommodation. Our quoted prices are fully inclusive of participation in the course, accommodation in our guest rooms, all meals and refreshments, and full access to the Carmelite Priory facilities, e.g., our meditation rooms, chapel and library. We believe that the benefits of learning about and journeying deeper in the spiritual life should be available to everyone regardless of their financial or life situation and that the transformational journey is enriched by a diversity of participants. Recognising that what is affordable for some can be a financial stretch for others, we are happy to offer a tiered pricing structure (Sustainable Price and Supported Price) for our courses. When you book, please select the price that feels appropriate for you. Our Sustainable Price is £1,800. This can be paid in instalments. Our Supported Price is £1,650. This can also be paid in instalments and reflects a partial bursary toward the cost of the course and is intended for those with minor financial need. This innovative training programme is run by a team of discalced Carmelite friars and other members of the Carmelite family. Each member of the team has completed the required formation in the Carmelite contemplative tradition and is faithful to living a contemplative lifestyle (a mindful attunement to the Divine Presence and integration of Prayer Practices into their daily lives). The team is led by Alexander Ezechukwu, OCD, a Carmelite priest and a trained spiritual director with many years of pastoral experience in guidance in the spiritual life. He holds a Licence in Sacred scripture from the Pontifical Biblical Institute, Rome. Fr Alex also serves as the CACS Director of Programmes. Please write to the Director of Programmes, Carmelite Priory, Boars Hill, Oxford OX1 5HB, giving your name, address, telephone number(s) and email address, together with a non-refundable deposit of £200, payable to ‘Carmelite Priory (CACS)’.